Buy now these 15 French songs by clicking on the button below. Laurence Jalbert - Qui est cet homme? Prepare now to sing in French until dawn. (Translated from French) "Thank you for taking note of our special requests. Thank you for creating karaoke CD's in French because we really love to sing in our mother tongue..."
Click here now for the reseller plan! without finding any good ones? It's for this exact reason that I created this web page. You will discover how to obtain French karaoke songs : (1) of superior quality, (2) in large quantities, (3) recorded in stereo, and (4) at competitive prices. You will save time and money. You will sing even more French songs. All that waisted time looking for French karaoke! It's a representative of DJ equipment that first introduced me to karaoke. I didn't know karaoke and had never sang in my life. Good salesman that he was, he convinced me that I should offer karaoke in my sound and lighting store. I then ordered a few systems to use as demos. My clients and DJ were very happy to know that I was offering this new product. They were very impressed by the quality of the machines and the music. But when came the time to buy or sign the contract, my clients would refuse. I heard many times the same objection: "There are no French karaoke songs.". I was unable to sale even 1 system! I then started to look for karaoke in French. I looked everywhere. I found nothing and was totally discouraged. Just a bit before december and the Christmas festivities, like a gift from the sky, I was finally able to put my hands on 5 CD's of French karaoke. These 5 CD's cost me a real little fortune! But, did I really have a choice! Today I don't regret a thing. No other product in my store was as successfull as those 5 karaoke CD's in French! That year karaoke really worked well. Even if the clients were limited to only 1 or 2 French CD+G per kit. They were happy, smiling from ear to ear, they would tell me how succesful there karaoke evening had been. How they sans all night right until dawn. Honestly at that moment I thought I was on another planet (Karaoke Planete®). Have you also complained of the lack of French karaoke? 5 Karaoke CD's was nice but my clients wanted more. They demanded more karaoke songs in French. They wanted popular French songs on the TOP40 like there was in english. They wanted quality and a competitively priced product. There was nothing like it on the market at the time! What to do? It's for this reason that I created superior quality French karaoke music! Now my company specialize in French karaoke. If French karaoke is what you want you will be well served. My company has become #1 world wide in French karaoke. There are 3 reasons for this strenght: high quality products, no surprise pricing and especially 45 000 faithful clients. French karaoke made by francophones! (Translated from french) "...I bought a nice little karaoke kit earlier... I just wanted to say to the man who sold it to me not to be shy to promote this product, it's working extremely well!" You have searched without success for French karaoke? You found some but they were to expensive? A salesman told you he had some? Deception! It was an excuse to get you into his store? The other day you saw some on the Internet. You didn't buy it and now you can't find it? You were able to buy them but the sound is aweful? You saw "karaoke" on the cover but it is not CD+G and it doesn't work in your karaoke machine? You thought it was a good deal but the songs are no good? All these deceptions are frustrating and unplesant but you will never give up on singing karaoke in French. "Stop running - And sing in French!" Sing in French more often then ever. Have French karaoke within reach. Deal directly with the manufacturer illiminate the middle man and save. See all the words of the songs on screen in CD+G. Listen to high quality music in stereo. A disc filled to capacity with 15 popular French songs. Be able to make special request for futur compilations of French karaoke. This is only a glimpse of the many advantages you will find. It's by singing that you will feel like a master. That is why I created Karaoke Planete®! The real words to these French songs will appear on your screen in perfect time with the music. What could be better than to sing in your own language or to learn the French language. French karaoke is also the nicest French songs. Can you hum some of these? Soon you will sing these songs and much more. How? The best karaoke in French! My mission is to make you sing, sing and sing again on the best French songs. High quality karaoke songs appeals to fans of karaoke. The francophone karaoke that I make will please you by its sound quality, by the on screen quality of the lyrics and by the variety of choice karaoke songs. Pleasure is garanteed. Do you want good sound quality? You will immediately feel like your idol when you hear the quality of the sound as you get up on stage. From the very first note you will vibrate inside like a professionnal singer. The quality of the sound is garanteed by the modern technology, the use of high sofisticated studios and the use of professionnal musicians. Sound quality is so good that it's hard to believe that it's not the original soundtrack. To add to the realism and quality all the soundtrack are recorded in stereo like the original. You will look like a professionnal on stage as the lyrics come up on the screen so that you can read them and sing them at the same time with the same rythm as your idol.The quality of the graphics and the lyrics of the songs are garanteed by the use of highly sophisticated softwares that are constantly being upgraded. The text of the songs are carefully revised to reflect as accurately as possible the authors orginale piece. 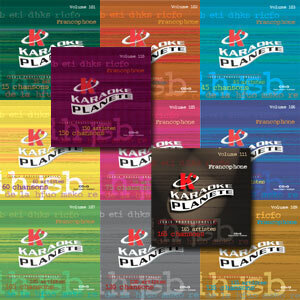 You will be pleased to show your Karaoke Planete® discs to those around you, because they look good and are well made. Perfect content should also deserve a packaging that matches, no slumping on presentation. Professionnal graphique artists and printing pros gave these high quality albums the image they so richly deserve. By offering Karaoke Planete® albums to your friends you will be recognized as being a person of good taste that offers gifts of great value. How to make a special request? The selection of French karaoke songs is based on your special requests. Just like you, thousands of karaoke fans sent me their special requests of French karaoke songs. These request are then sent to the authors of these songs so that we may obtain their written permission. These autorisations are necessary to obtain the license to reproduce the songs in CD+G karaoke format. Contribute as of right now to the planing of futur albums of French karaoke. It is now your turn to suggest a song title that you would like to see on futur albums. Click here now to write me an email with your special requests of French songs. 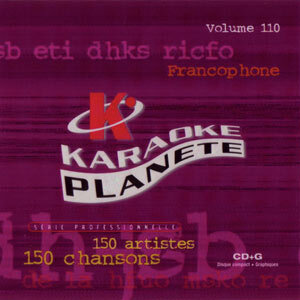 You could win a free Karaoke Planete® disc if the song you ask for is chosen for our next French karaoke recording. Your name will be kept and you will be eligible for the drawing of this album. The premier of any new album of French karaoke songs is announced by email to more than 14 000 members that are already registered on my website. "Do not miss the next French karaoke premier!" Click here now to register. Carefully write your date of birth and you could win one of the next Karaoke Planete® production if its premier date coincides with your birthday. There is nothing to worry about if the kids decide to play frisbee™ with a Karaoke Planete® disc. All discs are guaranteed for life against all damage including breakage no matter what the reason is, just return the CD (even if it's in pieces) and it will be replaced free of charged no questions asked. For a high quality product there must be an equivalent garanty, unique and worry free. A warranty that is also an insurance. No matter what happens to your precious CD's your mind will be at ease. Karaoke Planete® guaranties it's French karaoke discs for life against all problems or damage that would render them unusable. To be considered unusable the CD should not be able to fonction as new. To be replaced though the CD's or all it's pieces must be returned postage paid to Karaoke Planete® in it's original packaging with all the accessories. This garantie is applicable as long as the products is available and for sale. Right here is where you will find the French karaoke you are looking for. A few clicks and you will be singing French karaoke from the comfort of your own home. After the song list of each CD+G all you have to do is to click on the button "To place your order, Click Here Now!" to add this CD+G to your shopping cart. At any time you can empty your shopping cart or remove an article. N.B. : The shopping cart opens a new window in your browser, make sure that the "pop-up" fonction is not being blocked during this operation. (Translated from french) "... I really appreciate all the karaoke CD's I bought from you and the karaoke machine, the whole thing bring me lots of pleasure singing almost every day." Buy 2 or more CD's, and save on shipping fees. It's easy to understand, sending 5 CD's at the same time does not cost 5 times the price of shipping only 1 CD! It is now time to take another look at the CD's you must get by using the lists of links below to go directly to a CD, it's cover picture and it's list of songs. After the list of songs of each CD, all you need to do is click on the button "To place your order, Click Here Now!" to add this CD to your shopping cart. Do you want the maximum of French karaoke songs for your money? I told you how to save when ordering my karaoke CD+G's! What would you think of optimizing your investment? Obtain what no one has ever obtain before? Do you want to be part of a select group of people that want to get the most for their money? I have what you need. Here is a new offer when buying my 11 French CD+G's. Buy these 11 CD+G's with 165 popular songs + 10 BONUS by clicking now on the button bellow. BONUS #1 - Indexed list of artists. One artist is your all time favorite? His or her songs are all together and in alphabetical order. BONUS #2 - Indexed list of all the discs, making finding a song easy. BONUS #3 - Indexed list of titles. If you can only remember the title of the song, this list will be usefull to you. BONUS #4 - 1 Red case with room for 24 of your best CD, CD-ROM, DVD and/or CD+G. This beautiful case (valued at $14.98) is yours free by ordering now. BONUS #5, #6, #7, #8, #9 and #10 - In this case you actually find 6 other CD+G in French that I offer for free. A gift of $110.00. On top of these 10 BONUS (a value of $139.00) and a saving of $80.00 on individual shipping... You obtain my 11 French karaoke CD+G's for only $439.50 $298. An additional SAVING of $141.50! In total you get $360.50 of bonus and savings. Now`s the time to take advantage of this exceptionnal offer! Buy these 11 CD+G's with 165 French songs + 10 BONUS by clicking now on the button below. Do you have a store? Do you have a website? Do you have a karaoke with private rooms? Do you have lots of friends? Do you have a network? Looking for a gift idea? If you answered YES to any of these questions you will be interested in my offer. I showed you all the benefits obtained by purchasing my collection of karaoke in French, it is now time to benefit all your friends and/or customers. A collection at lower costs is a priceless gift! P.S. : Even if you scratch a CD I will exchange it no questions asked. It's a lifetime garanty because I know how much you will appreciate my CD's and the lifetime of pleasure they will procure you. P.P.S. : If you already own my earlier albums and would like to complete your collection without paying twice for the same album, click here to find out about my offer. P.P.P.S. : On my CD+G they are not 4, not 5, or 6, not even 8 songs, but 15 differents songs of French karaoke per CD. That's 80% more songs per CD. That's 2 to 3 times less CD to manipulate. Have you thought of all the time, space and money I will make you save with my CD's? P.P.P.P.S. : My new site is a secure site and you do not risk anything by ordering directly on line. P.P.P.P.P.S. : Come visit regurlarly to see my new production of French karaoke. P.P.P.P.P.P.S. : You didn't order yet? Did I told you all my prices are in canadian dollars? CAUTION: This offer is not available in stores.